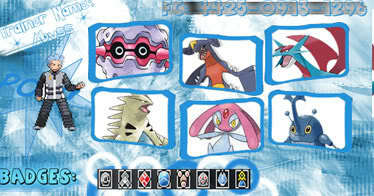 Pokemon you may get from me! What do I want for these? Alternatively just offer something you think is worth the pokemon and I might trade. I will also EV train one of your pokemon if you get me a shiny. I will FULLY EV train them in the stats that you want. So post what shiny you have a what you want your pokemon EV'd in. Location : Scoring goals on the soccer field. I know what you can do next time. Post all your first post. then type your new message at the bottom. Then delete the old post. Reserve the Celbi for me. I will try to get you a careful forry with max hp. Thanks Maple - the Celebii is now reserved! But because it is reserved I will be putting in a new pokemon....... Shiny Gyrados! YEAH! I dunno! Got it off the GTS! In fantastic Pokémon what nature is your shiny Suicune? What do you want for it? Is it EV'd? I wnat that Weavile. What nature is it? Bashful - still want it? Female - does it matter? Ok I'll take it. It matters because i'm going to bred it with bunery to get a Jolly with good Attack and Speed Ivs. What you want for it? Offer something and I'll tell you - give a list and you're more likely to get one that I want! Errrmmm. I'm not good at offering. Offer anything and I'll check if I have it. Do you still want the forry for Celebi?? Subject: Re: Pokemon you may get from me!